The 1779 Spanish Expedition out of Santa Fe to rid their New Mexico Colonies of Chief Curno Verde and his raiding Comanches. Important to those interested in early El Paso County and Old Colorado City because the Spanish came down Ute Pass and were in their first engagement where 'America the Beautifel Park' in Colorado Springs is today. You think local history only started when Zebulon Pike showed up in 1806, or when Anthony Bott and Julia Holmes camped here with the Lawrence Party in 1858 starting the local gold rush? Think again. Not only were gabby French trappers here in the early 1830's finding no beaver along the bubbly stream they called "Fontaine qui Bouille" - the boiling fountains. But the Spanish were here a lot earlier than even the French. Where do you think the name '[[Colorado]]" came from? The Spanish ' colo red' from the color of the sandstone round these parts . And it was the 'Colorado City' Claim Club's representative who went to Congress to get a new Territory, alongside [[Denver | Denver City]], who persuaded the Washington lawmakers to name it 'Colorado" - after the name of their town, natch, instead of "Idaho" or 'Corona" which they were considering. Ah but the really noteworthy Spanish event that happened right around here 80 years earlier than the first stake was driven for Colorado City, was the battle between [[Juan Bautista de Anza]], the Spanish Governor of New Mexico, and the really bad Indian [[Comanche]] Tribe led by [[Cuerno Verde]]. For ever since the Spanish took over '[[New' Mexico]] and founded [[Santa Fe]] in 1609 and tried to 'colonize' the region, some Indian tribes gave them great trouble. By the 1760s the [[Comanche]]'s with horses and rifles they obtained by trading with the Spanish, repeatedly raided the settlements north of [[Santa Fe]], such as Ojo Caliente, which the Spanish had to abandon, retreating over the rugged '[[Sangre de Cristo]]' range to the plains where they held sway over all other tribes. The Spanish soldiers never could catch up with them. The Ute's and [[Apache]]'s feared and hated them. The Spanish crown was frustrated. The Comanches were led by the fierce Chief [[Cuerno Verde]] - whose father had been killed in a raid at Ojo Caliente decades earlier. But along came the founder of [[San Francisco]] Juan Bautista de Anza II, who had fought Indians in California, and told King Charles of Spain that if he made him the Governor of New Mexico he, Juan Bautista, would rid Spain's colonies of that Comanche "Scourge"! Great chance for glory back in Spain, not so incidentally. So in 1778 de Anza was made Governor of New Mexico and Military Commander in Santa Fe. He immediately set out to prepare to attack the Indians with a radically different campaign plan - to go around behind the Comanches on the plains and trap them. And to supplement his force of only 120 Spanish soldiers with 400 Utes and Apache's who were only to glad to do in Cuerno Verde whom they had reason to hate. On August 15th, 1779 he set out with 600 men and 1,200 horses heading due north past abandoned Ojo Caliente and Antonito into now southern Colorado, and travelled across the whole 100 mile length of flat [[San Luis Valley]], over Poncha Pass, and into what we know as South Park. Then turned eastward. Guided by the Utes. Now there was always, until 2001, a dispute, where he came down onto the plains. Some argued it was down the Arkansas and thus through today's super narrow [[Royal Gorge]]. Others vaguely suggested the south side of Pikes Peak where the gold camp road is today. But when a determined scholar, Dr. Wilfred Martinez of Pueblo, who reads and writes Spanish of course, and whose ancestors actually include the Cartographer of Anza's command, did a brilliant feat of scholarship, he presented and published his book "Decisive Battle' just in time for the 6th Annual World Anza Conference in 2001 in Pueblo which I attended. It demonstrated conclusively as far as I was concerned that Anza led his Army right down Ute Pass through where Old Colorado City lies today, astride Fountain Creek. Then things started poppin! Anza's scouts spotted a large encampment right where Colorado Springs is now. Anza had his first engagement with the Comanche's rear party right where Fountain Creek meets - the confluence - with Monument Creek - in today's downtown Colorado Springs! He attacked the Comanche base camp, and started a running battle southward along the route of Fountain Creek, which he called the Santa Rosa. The pursuit carried nearly as far as Wigwam (south of Fountain today) Over 500 horses were captured along with all 120 of their tipi poles sets and supplies. 30 Indians were killed, including 18 warriors, and 34 were captured. After torturing several Comanche prisoners, Anza learned that Cuerno Verde with his braves was on a raid and would be coming back to the encampment. So Anza pressed on southward to the Arkansas - called Rio Napeste - crossed it and continued at least 20 more miles down the front range over the next 3 days until he met head on with unsuspecting Cuerno Verde coming north. The bold Comanche chief foolishly attacked the 600 Spanish, Utes and Apaches with his 250 braves, but his small chief's band of about 50 got cut off and were annihilated for his troubles. Cuerno Verde was dead. That was September 3d, 1779. Thus ended the battle of Cuerno Verde - Green Horn - and with it the Comanche scourge. Which is why the mountain that looms above the battlefield off I-25 is named that - Greenhorn. Cuerno Verde's 'Green Horned' headdress was sent back to Spain as a trophy, disappearing there over the last 200 years. Two other solid proofs that Spanish were here in very early Colorado came first, in 1894, when a workman discovered, while digging foundations at 529 East Pikes Peak, a four by six inch very corroded iron box containing a bejeweled crucifix with a Maltese Cross and another cross of hammered brass. The travelling kit of a Priest. They too, after Irving Howbert saw them, disappeared. They well could have from the Anza Campaign of 1779. The other one I had personal possession of, for a while. 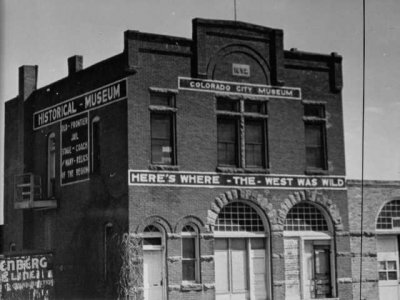 In 1977 while I was helping revitalize Colorado City, I discovered that old John Bock had had a commercial museum in the 2d City Hall building on the corner of 26th and West Cucharras. A B&B today. He had to close it when the City opened its 'free' tax supported Pioneer's Museum. I bought, at auction for about $6,000, many items from that long closed museum which I donated to the Old Colorado City Historical Society. One of the items I got was a very old Spanish brass Stirrup. Which Bock got on one of his trips around 1919 to far south east Colorado to buy horses for his stables in Colorado City. Ranchers who knew him when he was cowboy there before WWI, either gave or sold that brass full foot brass Spanish stirrup to him. It was of a too old Spanish Army style to have been carried by Anza's men. Scholars told me the style was not used by the Spanish soldiers after 1600. But it was clearly authentic. Where The Second City Hall of Colorado City stood at 26th and West Cucharras until Colorado City was dissolved in 1917. After which John Bock bought the building for his Museum. So where did it come from? Well, that's the story of Purgatory canyon in far southern Colorado. In 1539 a Spanish exploring party with a Portuguese commander and Spanish second in command together with two priests entered Colorado looking for the fabled Seven Cities of Cibola. The second in command killed the commander in a jealous rage, and the two friars said they would not continue with an evil commander. They turned back. The expedition was never heard from again - wiped out undoubtedly by the Apaches who dominated that area then. So the route they took was ever after named "El Rio de Las Animas Perdidas en Purgatoir" - the River of the Lost Souls in Purgatory. They had not had last rites! Pieces of Spanish armor and other items were found in scattered places, as late as 1924, in that same canyon. The odds are that Spanish stirrup came to me from there, or another Spanish expedition like it, all looking for the Cities of Gold before 1600. 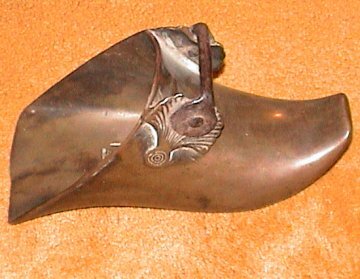 I displayed that Stirrup in a mini-museum in Old Colorado City in 1978. It was stolen! C'est la Guerre, as those French explorers would say.